Photographer Frank Herfort's recent book Imperial Pomp is a beautiful collection of images depicting a very strange breed of architecture in Russia. Herfort traveled extensively—over 15,000 miles—to various cities and remote areas of Russia, Kazakhstan, Azerbaijan, and Belarus with camera in tow. His purpose was to document the huge buildings, some monolithic, some opulent, erected in the years following the collapse of the Soviet Union. The buildings pictured are a discordant mix of styles and structures that represent a forceful push toward modernity amongst a backdrop of more modest economic realities. 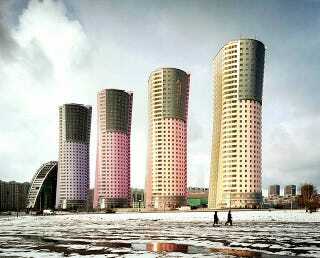 The photography does well to depict the contradiction between the overall landscape of post-Soviet Russia and the immensity of these buildings which awkwardly jut out of the horizon. Herfort used a Sinar 4 x 5 large format camera and a Cambo Wide DS with digital back, perfect for accentuating the scale and each location.